What would be your idea of a great way to spend a cold, wet dreary January day? Breakfast in bed maybe? Reading a good book by the fire? Enjoying wonderful comfort food with a glass of fine wine? How about going for a walk. Like a more than 450km walk. That's what Dee Gordon of Etobicoke Ontario is doing, right this very moment. What does this mean? What exactly is Dee hoping to accomplish? Aren't there all sorts of things set up to assist autistic people succeed, to help their families, to educate the public? Well, yes and no. Christopher Medeiros recently wrote a Days of Whine and Rosè article demonstrating the vast changes in autism awareness and acceptance over the last century. Yes, things have come a long way. But there are still huge gaps in what SHOULD be available, and for WHOM, and what is actually out there. Currently, service availability and delivery (and in actual fact WHAT services are deemed appropriate) are decided at Provincial/Territorial/First Nations level. Which means what services are offered depend on where you live in this vast great country of ours. Autism households in Alberta, Nunavit, Newfoundland, or on a First Nations reserve each have different funding resources and services. And to some extent that is fair. They are living in entirely different terrains and socio-economic cultures. But what a family and an autistic person needs to thrive at their basis are the same. It is the delivery of these services that needs to be adjusted according to community. In 2007 The Canadian Senate convened a committee to create a special report on Autism services and delivery. Titled "Pay Now or Pay Later"
The Committee has called on federal/provincial/territorial governments to collaborate onASD treatment. While the federal government supports Canada's capacity to address the special needs of children, including those with autism, provincial/territorial governments are responsible for delivering health and social services within their respective jurisdictions, with some exceptions for service provision to selected populations, including First Nations and Inuit. To assist provincial/territorial government to deliver these services, the federal government contributes funding through the Canada Health Transfer (CHT) and the Canada Social Transfer (CST) respectively. Provincial and territorial governments also have exclusive jurisdiction over primary and secondary education. More specifically, this provincial/territorial role includes responsibility for the allocation of jurisdictional resources to treatments for specific disorders and conditions. In terms of funding through the CHT and the CST, Canada's New Government is supporting renewed equalization. Providing $1.5B more in 2007/08 than last year, the Government of Canada is supporting fair treatment of Canadians in all parts of the country and enabling provinces and territories to provide their residents with comparable levels of services at comparable levels of taxation. All Canadians will benefit from provincial and territorial governments being well-equipped to invest in health care, post-secondary education, modern infrastructure and social programs. Moreover, through the 2004 Health Accord, the Government of Canada is providing provinces and territories with an additional $41.3B to support enhanced access to quality health services. With respect to First Nations and Inuit health and social services, the Government of Canada supports the provision of supplementary health benefits, the delivery of public health and health promotion services, and the provision of primary care services on-reserve in remote and isolated areas, where there are no provincial services readily available. The Government of Canada is actively engaged in efforts to enhance First Nations involvement in the delivery of health services, and to promote better integration and coordination of federally and provincially funded services. In other words, the federal government would assist the various provincial and territorial governments, with special assistance for first nations territories, to provide a uniform level of service availability, and indeed services period, across the country. So why, 8 years later, is this not happening? However we still do not have a Pan Canadian ideal of exactly what services should be provided, and to whom. THAT is what Dee Gordon is hoping to change. And why she is out walking over 450kms in the middle of the Canadian winter. Dee's 15 day trek started at Queen’s Park on Thursday, January 15th. She is walking 8 to 12 hours a day, each and everyday, culminating with a march on Parliament Hill on January 29th. 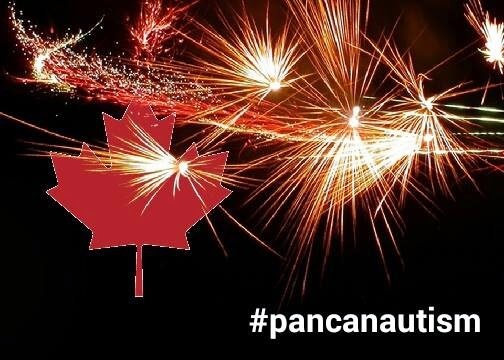 In addition to raising awareness, I am collecting signatures to petition the government for a National Strategy for Autism. The petition calls on the government to implement the recommendations of the Standing Senate Committee on Social Affairs, Science and Technology’s 2007 report on ASD Pay Now or Pay Later. Among others, the recommendations call for therapy, respite care, research and more. The petition was presented to the Speaker of the House on December 5th, 2014. Given a timeslot during the lunch hour, I'm not convinced the 15 second presentation was afforded any recognition at all (although I applaud MP Kirsty Duncan of Erobicoke North for presenting it). A petition asking the government of Canada to follow up on its own recommendations. Petitions are helpful, and if you wish to sign, please click here, but we all know if a petition alone could get things accomplished than Grumpy Cat would now be cloned. So if a petition, and even a Member of Parliament presenting your petition to the House isn't enough to get the government to act, what is? My own grandmother, many many decades ago, also walked on Parliament Hill. She was part of a group of twelve people. "The Friends of Shut Ins". From their march, and pressure from public opinion, what are now the disability tax credits and disability pensions were created. Dee is hoping to garner public opinion to help push the Canadian government to enact their own recommendations. That's where you come in. Follow Dee, share her story, her hopes, contact your MP and ask if they are going to meet with Dee when she marches on Parliament Hill January 29th. 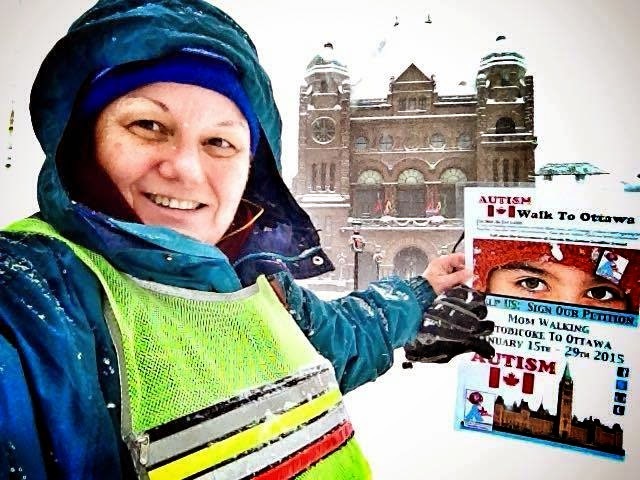 Help Dee get Parliament Hill to create a National standard for autism services and awareness. Here's Dee at sunrise this morning!! (trigger warning, she uses the word affected, but it is not meant in a "curist" vane).